What I am going to do next is to construct three bivariate Vector Auto-Regression (VAR) models to generate Impulse Response Functions (IRFs) in order to show what a shock to the monetary base leads to in terms of the price level and output. 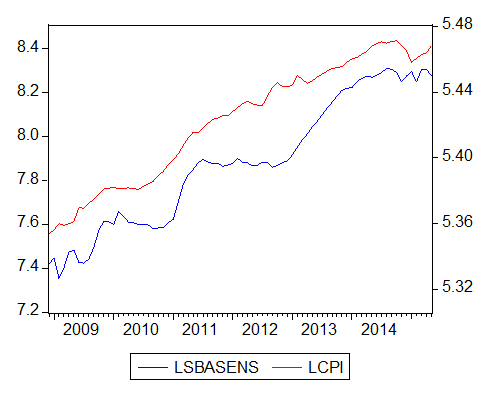 As mentioned in Part 1, the order of integration for the log levels of all four of our series (SBASENS, CPI, PCEPI and INDPRO) is one. With two unit roots per model, we are faced with a procedure that could lead to a VAR model in differences (a VARD), a VAR model in levels (a VARL), or a Vector Error Correction Model (a VECM). Using the Augmented Dickey-Fuller (ADF) and Kwiatkowski-Phillips-Schmidt-Shin (KPSS) tests I find that the order of integration is zero for all four series after they are differenced (as expected). In order to render the IRFs easier to interpret, for the rest of this analysis I have multiplied the natural log of each series by 100. Since there is no evidence of cointegration between the monetary base and CPI or PCEPI, we are really only faced with a choice between a VARD and a VARL in these two cases. This means we are confronted with a tradeoff between statistical efficiency and the potential loss of information that takes place when time series are differenced. In the interests of thoroughness, I am going to do it both ways. First, let’s estimate the VARDs. Most information criteria suggest a maximum lag length of one in both VARDs. The LM test suggests that there is a problem with serial correlation at this lag length, but this problem disappears when the lag length is increased to three in both of these VARDs. The AR roots tables suggest that both VARDs are dynamically stable at this lag length. 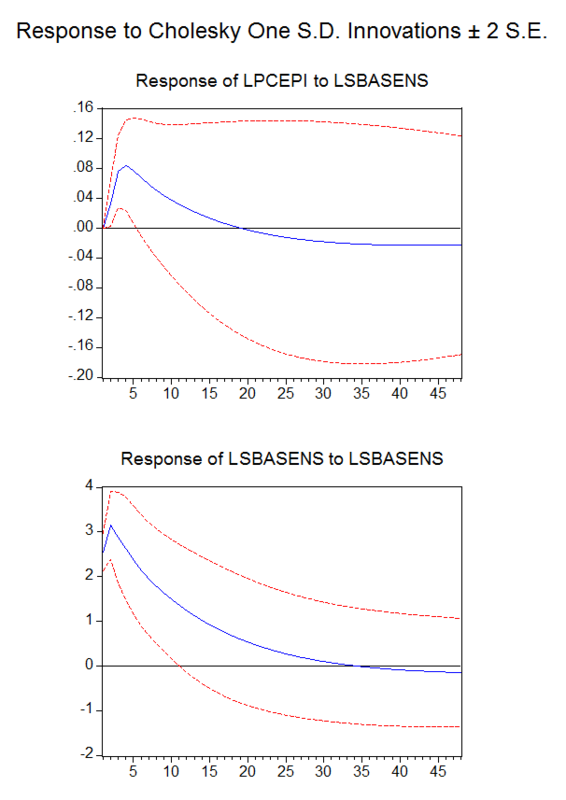 Motivated by the dominant practice in the empirical literature on the transmission of monetary policy shocks, I am going to use a recursive identification strategy (Choleskey decomposition). Such a strategy means that the order of the variables affects the results. I will follow the traditional practice of ordering output and the price level before the monetary policy instrument in each vector. The response standard errors I will show are analytic, as Monte Carlo standard errors change each time an IRF is generated. Here are the responses to a shock to the monetary base in the VARD including CPI as a variable. I’ll restrict the time period to 10 months as it isn’t of interest after that point. And here are responses to a shock to the monetary base in the VARD including PCEPI as a variable. 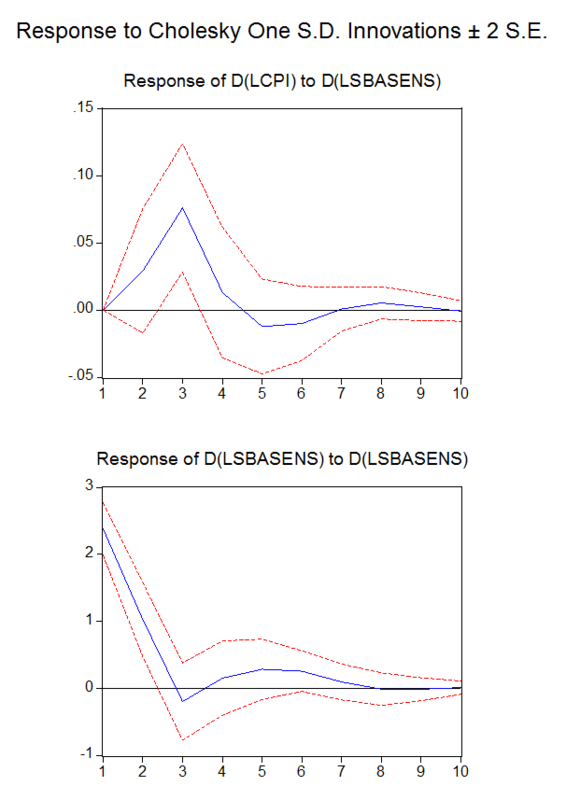 In each case a positive shock to the rate of change in the monetary base generates a statistically significant positive response to the rate of change in the price level (i.e. the inflation rate) in the third month. Changing the impulse definition to Residual or Generalized Impulse doesn’t change the results much, if at all. Now, let’s estimate the VARLs. Most information criteria suggest a maximum lag length of two in both VARLs. The LM test suggests that there is a problem with serial correlation at this lag length, but this problem disappears when the lag length is increased to three in both of these VARLs. The AR roots tables suggest that both VARLs are dynamically stable at this lag length. 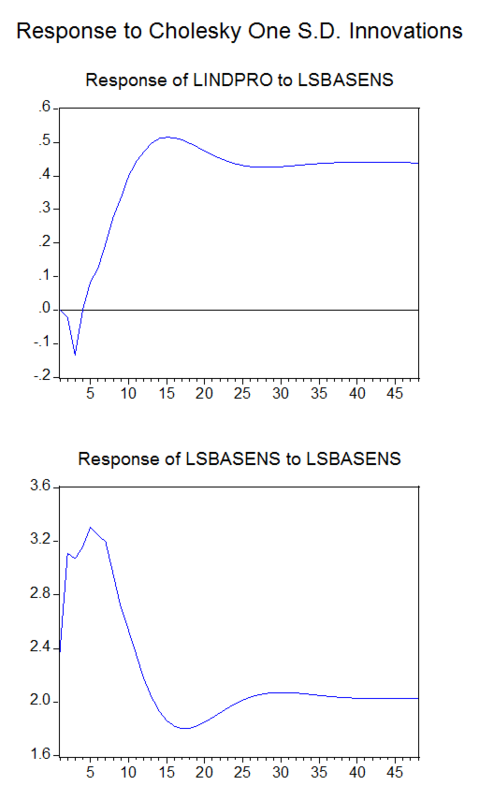 Here are the responses to a shock to the monetary base in the VARL including CPI as a variable. In this case I’ll extent the time period to 48 months. 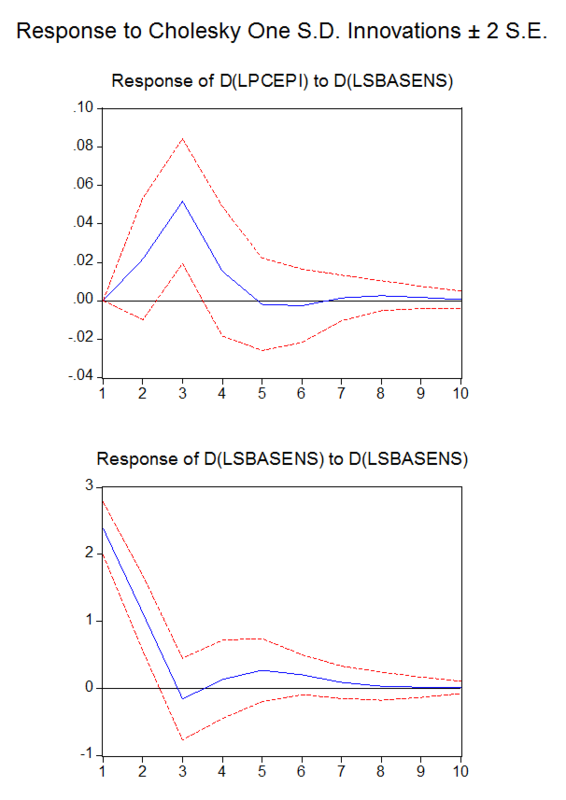 And here are responses to a shock to the monetary base in the VARL including PCEPI as a variable. A positive shock to the monetary base generates a statistically significant positive response to the CPI in months three and four. A positive shock to the monetary base generates a statistically significant positive response to the PCEPI in months two through five. Changing the impulse definition to Generalized Impulse renders the responses statistically insignificant (there is little difference using Residual impulses), but we’ve already established that the monetary base has a statistically significant positive effect on CPI and PCEPI with the VARDs. 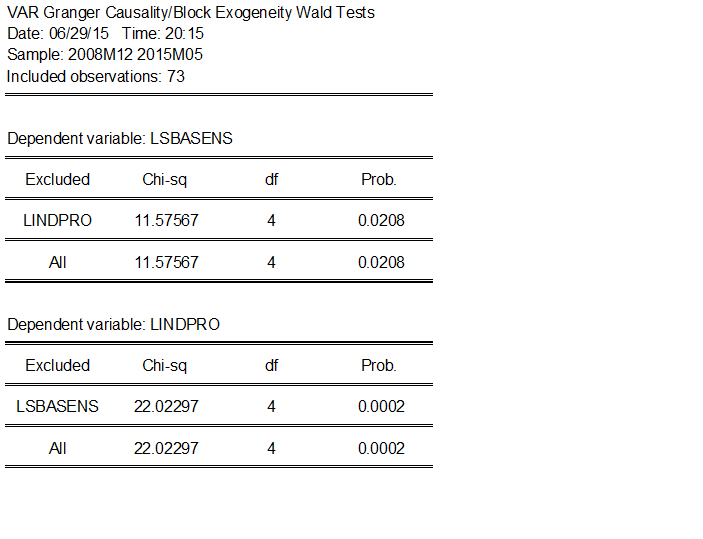 And, as I said earlier, there is loss in statistical efficiency when estimating a VARL with unit roots. The IRFs show that a 2.5% and 2.6% shock to the monetary base in month one leads to a peak increase in the CPI level of 0.12% and in the PCEPI level of 0.085% in month four respectively. In short, the empirical evidence does not seem to be very supportive of the Neo-Fisherite hypothesis. Now let us turn our attention to industrial production. 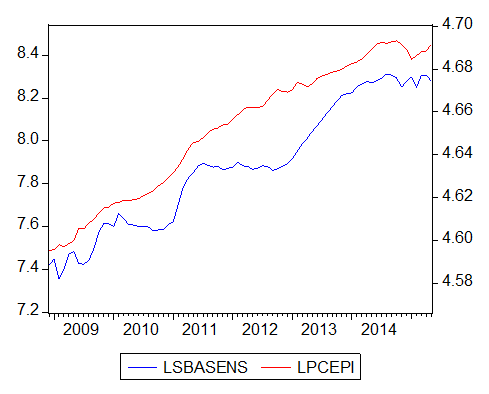 In Part 1 we showed that there is evidence of cointegration between the monetary base and industrial production. This means, in addition to the option of estimating a VARD or a VARL, we may also estimate a VECM. But before discussing the pros and cons of doing this, let us estimate a VARD and VARL first. I should also mention at this point that, in a book edited by David Glasner, “Business Cycles and Depressions: An Encyclopedia”, Neil Ericsson (in an article entitled “Distributed Lags”) argues that estimating a model in first differences alone when cointegration exists discards the information contained in the levels and leads to model misspecification. Consequently a VARL is probably preferred to a VARD in this case, but it may still be useful to estimate both. First let’s estimate the VARD. Most information criteria suggest a maximum lag length of three in the VARD. The LM test suggests that there is no problem with serial correlation at this lag length. The AR roots table suggests that the VARD is dynamically stable at this lag length. Here is the IRF for the VARD. A positive shock to the rate of change in the monetary base generates a statistically significant negative response to the rate of change in industrial production in the third month, followed by a statistically significant positive response in the fourth month. Changing the impulse definition to Residual or Generalized Impulse doesn’t change the results much, if at all. Now, let’s estimate the VARL. Most information criteria suggest a maximum lag length of four in the VARL. The LM test suggests that there is no problem with serial correlation at this lag length. The AR roots tables suggests that the VARL is dynamically stable at this lag length. Here is the IRF for the VARL. A positive shock to the monetary base generates a statistically significant negative response to level of industrial production in the third month, followed by a statistically significant positive response in months eight through 17. Changing the impulse definition to Residual doesn’t change the results much, if at all. Changing the impulse definition to Generalized Impulse eliminates the statistically negative response in the third month. The IRF shows that a 2.5% shock to the monetary base in month one leads to a peak increase in industrial production of 0.43% in month 13. Now, let’s talk about the pros and cons of estimating a VECM. The advantage of a VECM is that it can generate statistically efficient estimates without losing long-run relationships among the variables. Thus, if cointegration exists, and the true cointegrating relationship is known and can be given a theoretical interpretation, it’s generally acknowledged that a VECM should be estimated in the manner suggested by Johansen (1995). On the other hand, if the true integrating relationship is unknown, imposing cointegration may not be appropriate. Imposing incorrect cointegrating relationships can lead to biased estimates and hence bias the IRFs derived from the VARL. In cases where there is no theory which can suggest the true cointegrating relationship or how it should be interpreted, it is probably better not to estimate a VECM. Moreover, Sims et al. (1990) show that when a cointegrating relationship exists, the systems dynamics can be estimated consistently with a VARL, and James Hamilton (1994) appears to agree (pp. 651-653). As a final note on the pros and cons of VARDS, VARLS and VECMs when modeling and forecasting with cointegrated variables, I highly recommend this “hands-on” paper by Tim Duy and Mark Thoma. Nevertheless, I think it will still be interesting to estimate a VECM for industrial production. The following IRF is generated assuming a linear trend in the data and an intercept but no trend in the cointegrating vector. (Unfortunately VECM standard errors are not available in EViews.). A positive shock to the monetary base generates a negative response to level of industrial production in the second and third month, followed by a positive response thereafter. A 2.4% shock to the monetary base in month one leads to a peak increase in industrial production of 0.51% in month 15. In this model the response of industrial production is remarkably persistent with the level of industrial production still up by 0.43% nearly four years later. Changing the impulse definition (to either Residual or Generalized Impulse) slightly increases the response. In any case, as I’ve already implied, I don’t put much stock in this VECM. Here are a couple of preliminary observations. The price level responses seem less persistent than what multivariable VARs estimated in “normal” times with short term interest rates as the instrument of monetary policy show. On the other hand, the output response seems somewhat more persistent. In Part 3 I shall finally put output, the price level and the monetary base together in our baseline trivariate VAR model. Most highly publicized academic studies on quantitative easing (QE) seem to come in one of four flavors: 1) event studies on changes in security yields on the days of announcement (e.g. 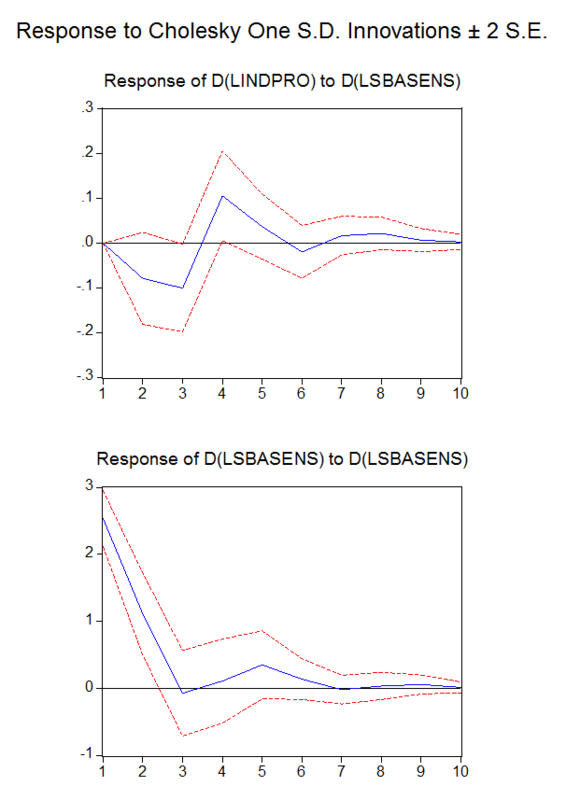 Krishnamurthy and Vissing-Jorgensen, 2011), 2) panel data studies on flow and stock effects of QE on daily security yields during the programs (e.g. D’Amico and King, 2010) , 3) times series studies on the effect of open market operations on security yields during normal times (e.g. Hamilton and Wu, 2011) and 4) studies on the macroeconomic effects of QE using major models calibrated to normal times (e.g. Fuhrer and Olivei 2011). The underlying assumption of nearly all these studies is that the primary channel of the Monetary Transmission Mechanism (MTM) is the Traditional Real Interest Rate Channel, which is almost certainly not the case at the zero lower bound (ZLB) in interest rates. Notably, there are very few empirical studies on the macroeconomic effects of QE during QE. Indeed, to my knowledge, there are only four: Honda et al. (2007), Girardin and Moussa (2010), Gambacorta et al. (2012) and Behrendt (2013). What these four studies have in common is that they focus on periods of zero interest rate policy (ZIRP) employing Vector Auto-Regression (VAR) methodology with the monetary base, or bank reserves, as the instrument of monetary policy. The convention in the empirical literature on the transmission of monetary policy is to estimate a VAR with a measure of output, the price level and a short term interest rate (along with other variables). Thus, the principal difference between these four studies, and what is the usual practice, is to substitute the monetary base (or bank reserves) in place of the short term interest rate as the instrument of monetary policy. Focusing on periods of ZIRP also presents some additional challenges. 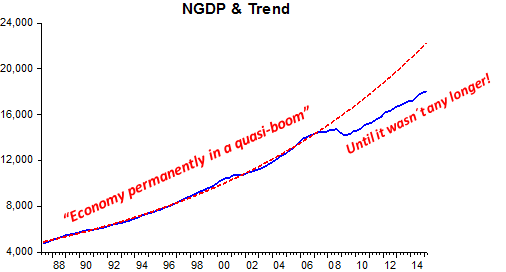 In particular, instead of having decades of data permitting the use of real GDP (RGDP) and the GDP deflator as the measure of output and price level, there is only a period of years usually necessitating the use of data at monthly frequency, meaning (for example) that the industrial production index may have to be substituted for RGDP, and that a measure of the consumer price level may have to be substituted for the GDP deflator, if a sufficient number of observations is to be available in order for it to be possible to generate statistically significant results. When constructing a macroeconomic VAR model (as I am about to do), it is especially desirable for the policy variable to Granger cause another variable (or variables) in the model. This is because, if the policy variable Granger causes another variable, then it provides statistically significant information about future values of the other variable. Under those circumstances we might expect shocks to the policy variable in the VAR model to lead to statistically significant changes in the other variable. The following analysis is performed using a techniques developed by Toda and Yamamoto (1995). Using the Augmented Dickey-Fuller (ADF) and Kwiatkowski-Phillips-Schmidt-Shin (KPSS) tests I find that the order of integration is one for all four series. 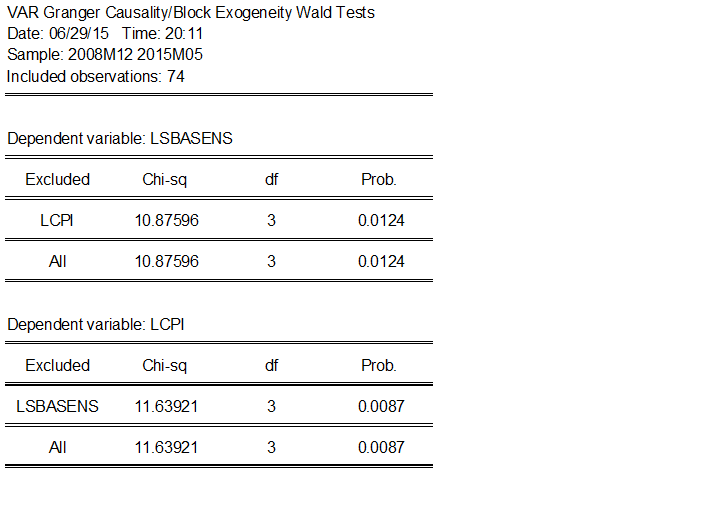 I set up three two-equation VARs in the log levels of the data including an intercept for each equation. Most information criteria suggest a maximum lag length of two for the pair of VARs that include the price level as a variable. 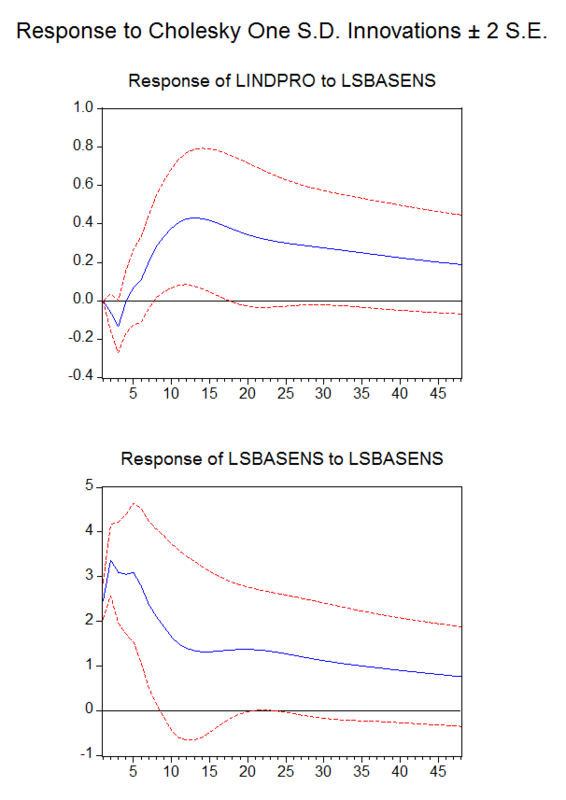 The LM test suggests that there is a problem with serial correlation at this lag length, but this problem disappears when the lag length is increased to three in both of these VARs. The AR roots tables suggest that both VARs are dynamically stable at this lag length, and Johansen’s Trace Test and Maximum Eigenvalue Test both indicate the two pairs of series are not cointegrated at this lag length. Most information criteria suggest a maximum lag length of four for the VAR that includes the industrial production index as a variable. The LM test suggests that there is no problem with serial correlation. The AR roots table suggests that the VAR is dynamically stable, and the Johansen’s Trace Test and Maximum Eigenvalue Test both indicate that the two series are cointegrated at this lag length. This suggests that there must be Granger causality in at least one direction between the monetary base and industrial production. Then I re-estimated the three level VARs with one extra lag of each variable in each equation. But rather than declare the lag interval for the two endogenous variables to be from 1 to 3, 1 to 4, and 1 to 5 respectively, I left the intervals at 1 to 3, 1 to 3, and 1 to 4, and declared the lag of each variable to be exogenous variables. Here are the Granger causality test results. I reject the null that CPI does not Granger cause the monetary base at the 5% significance level, and I reject the null that monetary base does not Granger cause CPI at the 1% significance level. I reject the null that PCEPI does not Granger cause monetary base at the 5% significance level, and I reject the null that monetary base does not Granger cause PCEPI at the 1% significance level. I reject the null that industrial production does not Granger cause the monetary base at the 5% significance level, and I reject the null that monetary base does not Granger cause industrial production at the 1% significance level. In other words, there is strong evidence of bidirectional Granger causality between the monetary base and CPI, PCEPI and industrial production from December 2008 through May 2015. Moreover the evidence for Granger causality from the monetary base to CPI, PCEPI and industrial production is slightly stronger than the evidence for Granger causality from CPI, PCEPI and Industrial production to the monetary base. The next step in this process is to determine the nature of this “correlation”. 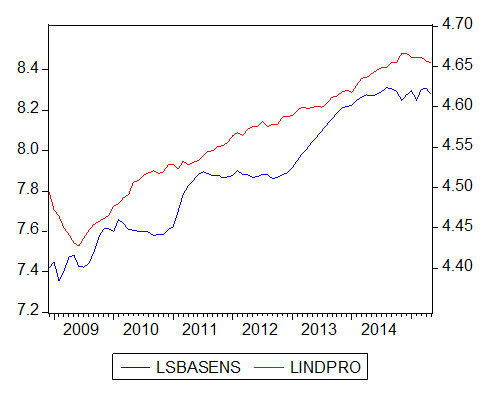 What does a shock to the monetary base lead to in terms of the price level and output? For example, does a positive shock to the monetary base cause the price level to decline (counterfactually) as the Neo-Fisherites seem to be claiming? Or might it cause the price level to increase (counterfactually) as Monetarists claim? And what happens to output? In order to determine this we need to estimate properly specified VARs, and then to generate the appropriate Impulse Response Functions (IRFs). For that, tune in next time. New “con game” in town: Naming dots! 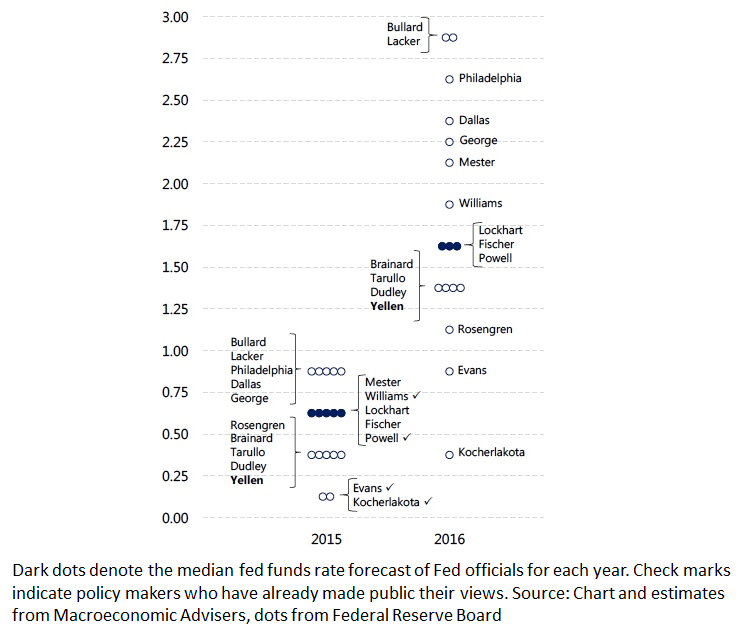 In what’s become known as the “dot plot,” Fed officials earlier this month showed the public their best estimates for where the central bank’s policy rate will be over the next few years. It’s valuable information for investors who are desperate to know how quickly borrowing costs will rise in the U.S. What makes things tricky is that these dots are anonymous, and no one’s views matter more than the chair’s. Enter Meyer, who was a Fed governor from 1996 to 2002 and is now senior managing director at Macroeconomic Advisers. He’s taken a stab at guessing which dots belong to whom (scroll down for the chart). He estimates that Yellen in June foresaw a single rate hike this year. That would make her dot one of five at 0.375 percent, which is below the median of her fellow Federal Open Market Committee participants. Meyer also expects her to change her view by September, by which point he expects to see an economy on stabler footing. In the last two weeks, three Federal Reserve officials have said or implied that the first rate increase could take place in September. The reaction? The September federal funds futures FFU5, +0.01% set a new contract high of 99.83, an implied yield of 0.17%. Yellen: I think it’s very clear what we mean. If policy makers want to understand why markets are ignoring the likelihood of an imminent increase in interest rates, look to the ever-changing nature of the guidance. Say what you mean, mean what you say, and realize that some things are best left unsaid. The Bank for International Settlements Proposes Sadomonetarism To Promote Recovery, Higher Inflation What Greek Crisis? The central banker’s club known as the Bank of International Settlements (BIS), suitably HQ’ed in Basel, Switzerland, this past weekend released its annual report, and advocated the globe’s major central banks raise interest rates to combat the chronic lack of aggregate demand and low inflation-deflation dogging the world’s developed economies. Paul Beaudry and Franck Portier are two such researchers. They are famous for a 2006 theory saying that news about future changes in productivity could be what cause recessions and booms. That model never really caught on — it always had some issues with the data, and it definitely didn’t seem to be able to explain the Great Recession. But it inspired further research, and it was an interesting and novel idea. 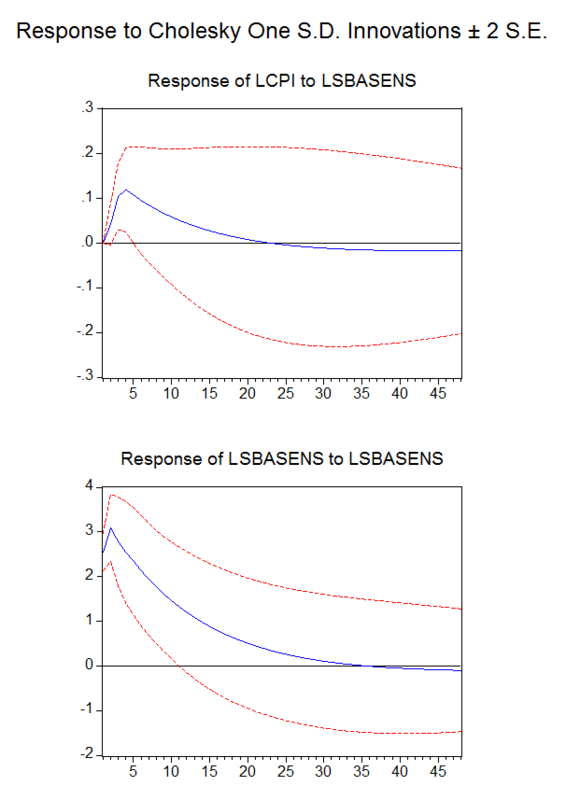 In a new paper called “Reviving the Limit Cycle View of Macroeconomic Fluctuations,” Beaudry and Portier try to think of reasons why booms might cause busts. The mechanism they come up with is pretty simple. You have a whole bunch of people — basically, companies — who invest in their businesses. The amount other people invest affects the amount I want to invest, but I can only adjust my investment slowly. When you have feedback effects like this, you’re going to get instability in your model economy, and that’s exactly what the authors find — the economy experiences booms and busts in a chaotic, unstable way. To reproduce the randomness found in the real economy, the authors simply add in some random “shocks” to productivity. BP&G´s latest seem to be a variant of RBCT, where the “trend is the cycle”, or where growth and fluctuations are one and the same. The economist who introduced this idea into economic theory was Alvin Harvey Hansen. Born in 1887 in rural South Dakota to immigrants from Denmark, he came from the frontier that according to Jackson was ending. After majoring in English, he moved to the University of Wisconsin to study economics and sociology, before moving to Brown and writing a thesis on business cycle theory, in which he became a specialist. His early work, Cycles of Prosperity and Depression (1921) was empirical. Believing the British economist, John A. Hobson, to have rebutted the charge that under-consumption was impossible, Hansen explained cycles of prosperity and depression as the result of changes in money and credit. During the 1920s, turning to the ideas of Albert Aftalion, Arthur Spiethoff and other continental European writers, he began to see fluctuations in investment, driven by population changes and waves of innovations, as the root cause of the cycle. He still thought monetary factors played a role, but they merely served to magnify other forces rather than being an independent factor. These questions can be debated. But it is fairly clear that even in the 1970s there was not enough empirical evidence in support of Friedman’s ideas to justify their growing dominance. And, indeed, there can be no denying the fact that Friedman’s cure proved to be an inadequate response to the Great Recession – strongly suggesting that it would have fallen similarly short had it been tried during the Great Depression. The dominance of Friedman’s ideas at the beginning of the Great Recession has less to do with the evidence supporting them than with the fact that the science of economics is all too often tainted by politics. In this case, the contamination was so bad that policymakers were unwilling to go beyond Friedman and apply Keynesian and Minskyite policies on a large enough scale to address the problems that the Great Recession presented. Admitting that the monetarist cure was inadequate would have required mainstream economists to swim against the neoliberal currents of our age. It would have required acknowledging that the causes of the Great Depression ran much deeper than a technocratic failure to manage the money supply properly. And doing that would have been tantamount to admitting the merits of social democracy and recognizing that the failure of markets can sometimes be a greater danger than the inefficiency of governments. I find those arguments untenable. The Great Depression only ended when FDR intervened by delinking from gold. Nominal spending (NGDP) immediately turned around (the follow-up government intervention – NIRA – only retarded the process). 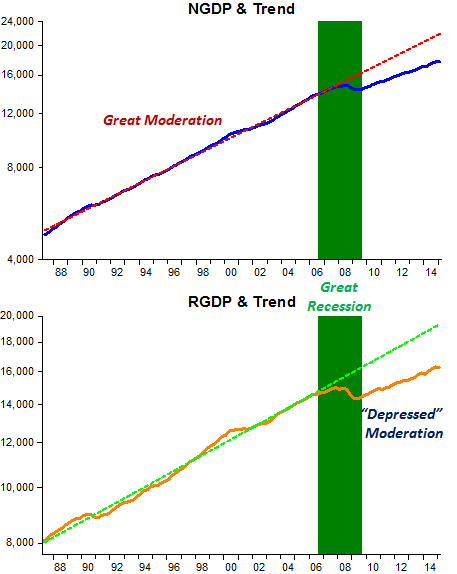 The “Great Recession” only bottomed-out when the Fed adopted QE1, and subsequent doses of QE have managed only to keep the economy humming along a depressed path. A target level for spending (or even prices) would have been a better monetary solution. “Capital expansion, rate of growth and employment” (Domar 1946). This focused on the relationship between productive capacity and national income. Investment was related to both of these, for it generated aggregate demand, which determined income, and it added to productive capacity. Because investment was linked to the growth rate of productive capacity and the level of income, Domar could show that there was an equilibrium rate of growth, at which income would grow at the same rate as productive capacity. Secular stagnation was what happened when investment grew more slowly than this, for in that case there would be an increase in unused capacity and unemployment. However, if, somehow, the growth rate of income could be guaranteed, the result would be sufficient investment to achieve growth without resorting to a government deficit. Saturday’s game also reminded me of one of the reasons that I like baseball so much. No other sport provides such a detailed record of performance, covering thousands of games and players back to the nineteenth century. That means that every game takes place in a rich historical context. In that context, Max Scherzer wasn’t pitching against the Pittsburgh Pirates; he was pitching against a standard of achievement established over decades. Thus, a one-sided baseball game on a hot and humid Saturday afternoon in Washington became a game that I and the other 41,000 fans there will always remember. Bernanke´s “monetary policy pitch” was also memorable, but for negative reasons! 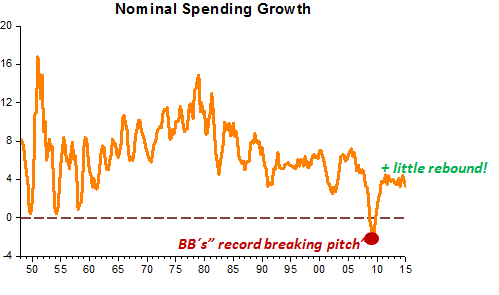 He´s the “post-war champion” in the “worst pitch in the Nominal Spending category”! The outcome: Little real growth, low employment and below target inflation. A “triple crown” achievement! The first Federal Reserve official to speak in the wake of this week’s central bank monetary policy meeting said Friday the Fed should raise interest rates twice this year. “We are getting closer and closer to the time to raise rates,” Federal Reserve Bank of San Francisco President John Williams told reporters following a hometown speech. “My own forecast would be to raise rates two times this year, if the economy performs as I expect.” He added he would like to see those initial increases at 25 basis points each. As he has on many occasions, Mr. Williams cautioned that whatever happens with a policy that now has short-term rates pegged at near-zero levels will be driven by how the economy performs. And while he is upbeat about the outlook for growth and hiring, he said there are still reasons to be cautious about raising the cost of borrowing in the U.S. economy right now. “My own view is there are still significant headwinds to this economy,” he told reporters. “Until I have more confidence that inflation will be moving back to 2%, I’ll continue to be in wait-and-see mode regarding raising interest rates,” he said. He couldn´t have been clearer! The subject of the United States “fiscal cliff” as a test of monetary policy offset at the zero lower bound in interest rates has recently come up yet again. Russ Roberts brought it up here. To which Scott Sumner replies here. For what it’s worth, here’s my two cents worth. I’ve said some the following before in more than one place, but this time I’ll try and be even more complete and explicit. To begin with, the sequester was only a small part of the U.S. fiscal consolidation that took place in 2013. The “sequester” refers to the automatic spending cuts in particular categories of outlays that were initially set to begin on January 1, 2013, as a result of the Budget Control Act (BCA), and were postponed by two months by the American Taxpayer Relief Act of 2012 (ATRA) until March 1. ATRA also addressed the expiration of certain provisions of EGTRRA and JGTRRA (the “Bush Tax Cuts”), the 2-year old cut to payroll taxes (the “Payroll Tax Holiday”) and federal extended unemployment insurance. An increase in income tax rates applicable to high income tax payers, an increase in the payroll tax, and a continuation of federal extended unemployment insurance went into effect on January 1, 2013. In short, the sequester only refers to the spending cuts that went into effect on March 1, 2013 and does not include the two major tax increases that went into effect on January 1, 2013. Based on the CBO’s November 2012 analysis of the “fiscal cliff”, and adjusting for the late start of the sequester, the tax increases that went into effect constituted approximately 70% of the budgetary effect of going over the “cliff”. This is why analyses such as these are far less than fully satisfactory. Furthermore, none of the forecasts concerning the effects of fiscal consolidation, by either the CBO, or the major private forecasters, referred to annual 2013 RGDP growth. They all referred to quarterly RGDP growth in 2013 or to year on year RGDP growth in 2013Q4. This because this is the more reasonable measure when the question is what impact a budgetary change starting at or near the beginning of a given year will have on subsequent growth. The Q4/Q4 measure is approximately the average of the four quarterly growth rates following the budgetary change, whereas the Year/Year annual measure is essentially a weighted average of the previous and current year’s quarterly growth rates. In this particular instance 3/8ths of the weights in the Year/Year measure come from quarters that occurred before even a single act of the federal fiscal consolidation went into effect on January 1, 2013. For more on why the Q4/Q4 measure might be preferred to the Year/Year measure in this case, see this for example. The CBO’s last full economic forecast of 2012 (which came out just weeks before QE3 was announced) called for 0.5% year on year decrease in RGDP in 2013Q4 assuming all of the projected fiscal tightening went into effect (Table 2-1). The previously mentioned November 2012 CBO analysis of the effects of the fiscal cliff states that eliminating all of its components would result in year on year RGDP growth in 2013Q4 being 2.9 percentage points higher (Figure 1). This implies that the CBO was forecasting that year on year RGDP growth would be 2.4% in 2013Q4 without any of the components of the fiscal cliff. A careful reading of the CBO’s estimates from November 2012 indicates that the fiscal consolidation (the 2% payroll tax increase, the high income tax increase and the sequester) should have subtracted 1.4 points from year on year RGDP growth through 2013Q4. Figure 1 shows that the CBO were estimating that extending the reduction in the payroll tax and extending emergency unemployment benefits would increase year on year RGDP growth by 0.7 points in 2013Q4 (line five). Footnote 15 on page 11 indicates that approximately 80% of the budgetary effect of this component was due to the reduction in the payroll tax. Assuming the fiscal multiplier for the reduction in the payroll tax and emergency unemployment benefits is about the same, the economic effect of not extending the reduction in the payroll tax thus was about 0.56% of RGDP (i.e. 80% of 0.7 points). Also, Figure 1 suggests that the economic effect of not extending lower tax rates for those with high incomes (the difference between line three and line four) is 0.1% of RGDP. The increase in income tax rates applicable to high income tax payers that went into effect under ATRA was actually somewhat smaller than what the CBO estimates were assuming, but probably not significantly enough to make it worth refining any further. And lastly, Figure 1 shows that the CBO were estimating that eliminating the defense and nondefense spending reductions (i.e. the “sequester”) would increase year on year RGDP growth by 0.8 points in 2014Q4 (the sum of lines one and two). But the implementation of the sequester was delayed by two months. A crude adjustment to this figure may be obtained by reducing it by one sixth (two out of 12 months) or to about 0.67% of RGDP. The sum of these three components totals about 1.4% of RGDP. Combining the CBO’s estimated effect of the three components of the fiscal cliff that actually did go into effect, with the CBO’s implied forecast in the absence of any of the components of the fiscal cliff of 2.4% RGDP growth, results in a forecast of 1.0% year on year increase in RGDP in 2013Q4. A similar thing applies to the major private forecasters. (Sorry, no links, but some of this can probably still be googled.) The effect of the fiscal consolidation (again, the 2% payroll tax increase, the high income tax increase and the sequester) according to Bank of America, IHS Global Insight, Moody’s, Goldman Sachs, Morgan Stanley, Macroeconomic Advisers and Credit Suisse ranged from 1.0% to 2.0% of GDP, with the average estimate being about 1.6%. The baseline forecast (i.e. the RGDP growth without any components of the fiscal cliff) prior to the beginning of 2013 of these same seven private forecasters was for year on year RGDP growth of 2.0% to 3.5% in 2013Q4 with the average forecast being about 2.7%. 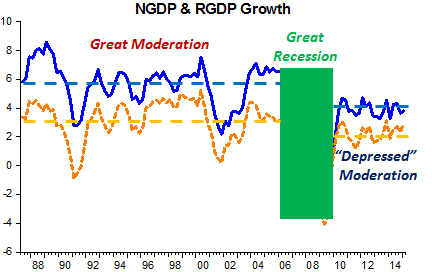 Thus the average forecasted year on year RGDP growth in 2013Q4 adjusted for fiscal consolidation was about 1.1%. This is almost exactly the same as the CBO forecast that I’ve teased out above. We now know that year on year RGDP growth in 2013Q4 was 3.1%, or significantly higher than what the CBO was forecasting, and higher than what most of the major private forecasters were estimating would occur without any fiscal consolidation at all. Or, in plain English, taking into account the monetary policy offset, the fiscal multiplier still appears to be zero, even at the zero lower bound in interest rates.